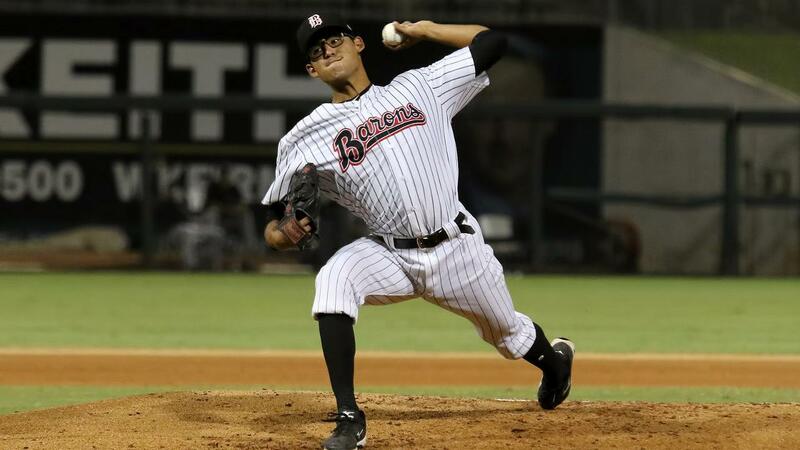 A big night from the top of the lineup was more than enough to back a quality game on the mound as the Birmingham Barons (65-72) were victorious, 6-3 over the Biloxi Shuckers (81-58), on Sunday night at MGM Park in game four of the five-game series. Moments That Mattered: After being shutout over the previous two games, the Barons snapped the scoreless streak at 21 innings with a Zack Collins sacrifice fly to score Luis Basabe in the top of the fourth. Two innings later, Collins again plated Basabe, this time with a double to right. In the seventh, the Barons doubled the lead on an RBI single from Joel Booker. A couple batters later, Collins came through with a two-out single to score Booker and give Birmingham a 4-0 lead at the seventh inning stretch. Turning Point: Birmingham turned to the bullpen in the bottom of the seventh, but Mauricio Cabrera provided little relief. He recorded just one out while walking four to get the Shuckers on the board. A sacrifice fly and RBI single scored another two runs. But Zach Thompson struck out Keston Hiura to end the inning with the tying run on second base, keeping the Barons in front 4-3. In the ninth, the Barons got two of the runs back on a bases loaded single from Alex Call, plating a pair of runs to put Birmingham up 6-3, the eventual final. By The Numbers: In one of his best starts of the season, Bernardo Flores (W, 3-5) shut down the Shuckers bats. Over 6.0 scoreless innings, he gave up just five hits without a walk while striking out three to earn the win. The quality start is Flores' 10th in 13 Double-A outings. Thompson earned a hold for his work to get out of Cabrera's jam. Brian Clark (S, 3) finished the win with a scoreless ninth to earn the save. Facts And Figures: The Birmingham offense broke through in a great way on Sunday. Booker was 2-for-5 with an RBI and two runs scored. Basabe scored three runs while going 1-for-3 with two walks. Danny Mendick took three walks while batting third and Collins led the way by going 2-for-3 with three RBI. Mendick also stole his team-leading 20th base, a new career-high. Up Next: The Barons conclude the 2018 season with a Labor Day matinee in Biloxi at 1:05 p.m. Kodi Medeiros (7-7, 3.46) will face his former team for the first time while Conor Harber (1-0, 1.53) is set to start for Biloxi. Curt Bloom will have the call on 960 WERC News Radio and the iHeart Radio app.